So I heard another tip from my underground Scranton pizza guy about a pizza in the Riverfront Sports plaza. When he described it to me, I knew I had been there before. When I last visited this location in Scranton, it was known as PRENO pizza, but as my informants in the area told me, PRENO is no longer in business (or no longer operates under that name?). It is now called Something Cheesy Pizza. The layout of the restaurant is exactly the same as it was during my last review, which is a pretty cool, café style pizzeria. To read more about the layout, feel free to check out my previous post on PRENO here. 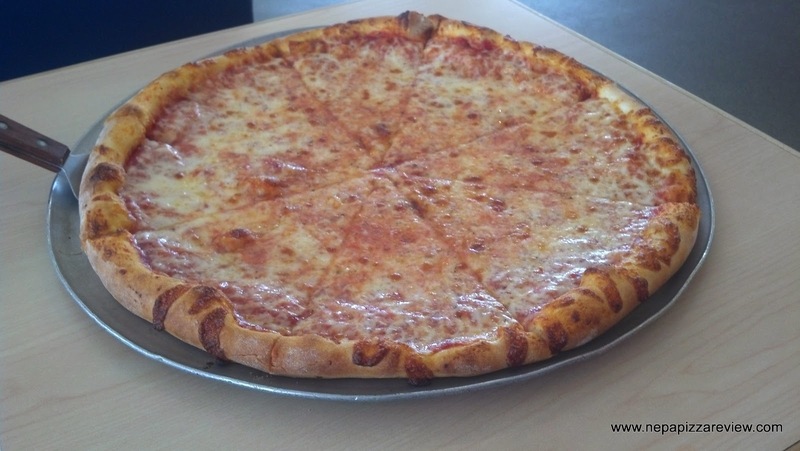 It appears that the new establishment has a slightly different menu including a traditional red pizza, square thick tray, thin round pizza, a pretty generous gourmet pizza offering, and the tempting “Cheesy Pizza” which boasts four different cheeses. Today I wanted to try the thin crust pizza simply because that’s what I was in the mood for, so that's what I ordered up. After placing the order, I noticed that the pizza maker immediately went to work on my order and sure enough, my pizza was done in less than 8 minutes, which was great because I was starving. The pie looked pretty well prepared with a thick outer crust, plenty of cheese, and cooked appropriately. 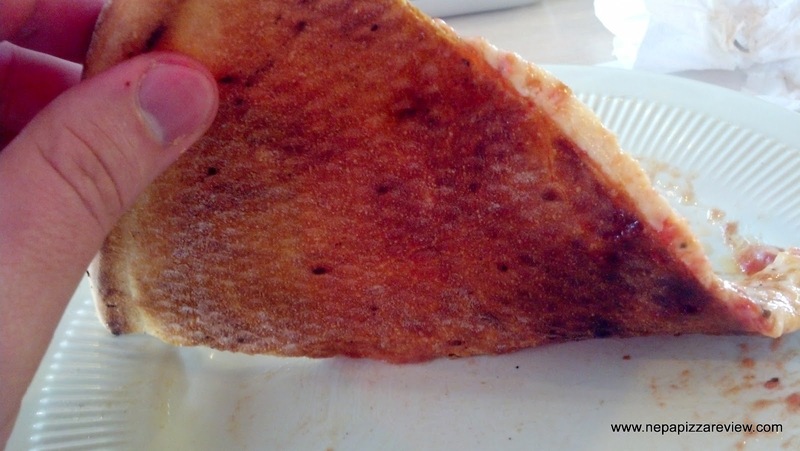 I took a look under the hood and noticed that this pizza was cooked on a screen, which is not my favorite way to cook a pizza, because it doesn’t allow the crust to get crispy, but it was cooked to a golden brown underneath and certainly looked appealing. As expected, the crust was not crispy when I took my first bite, but it was fairly tender and flavorful. This is your average dough that most people will generally like. The sauce was pretty decent, but a bit on the thin side for my liking. I did like the way that it was seasoned, but a little heartier and thicker consistency would have fit my tastes better. I would consider this sauce to be neutral - not sweet or salty. The centerpiece of this pizza, as you might have guessed by the appropriately named pizzeria, was the cheese. There was a generous portion of melty, stretchy, gooey, and delicious cheese on top. The mozzarella was slightly salty, but this was a very welcome saltiness that balanced the pizza out very nicely. 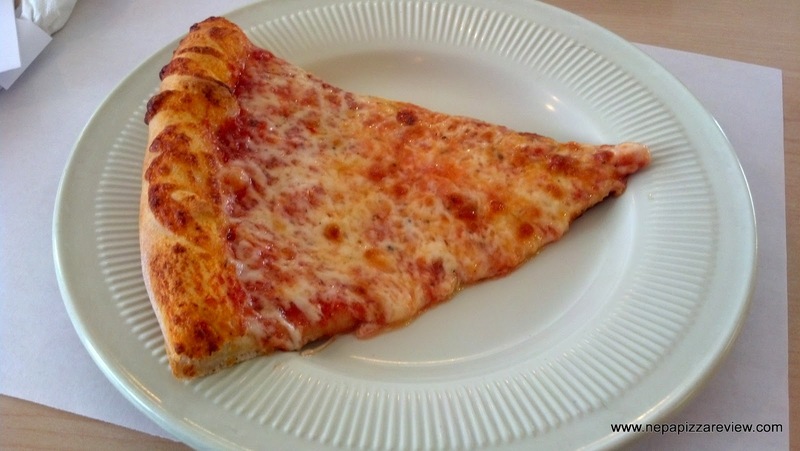 The cheese brought it all together for me and I enjoyed this pizza because of it. Overall, I would consider Something Cheesy pizza a great lunch spot to swing in and grab a couple slices of pizza or a sandwich. They have speedy service and good food. 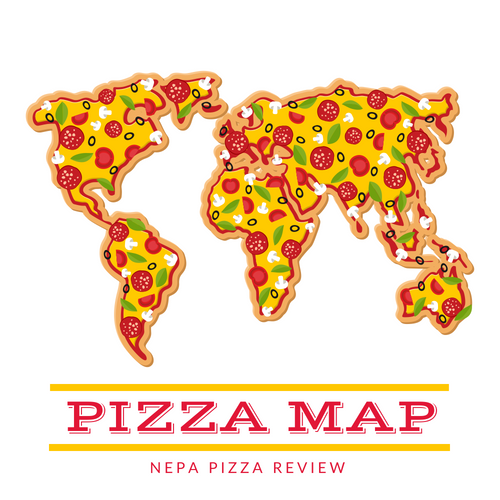 I would expect that the pizza would have mass appeal with most people, and their pizza would be good for takeout. 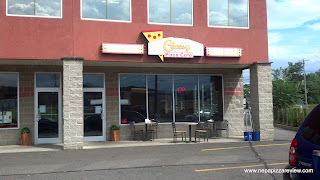 Given the good value of the large pizzas, this place would be great for grabbing a few "trays" of pizza for the party! So get out and try this "new" pizza café and let me know what you think!